Dishing it up! : Our last "Cupcake Friday"! Well here we are at the last “Cupcake Friday”. This month has been a lot of fun. Choosing this book, selecting the recipes, and then making them have been a great challenge. Thank you all for joining me on this ride. I really have enjoyed it. All of the cupcakes I’ve made have tasted really great. Some looked better than others, but they all were definite “do-overs” as far as Bob and I are concerned. And there are more that I want to try. But I promised Bob I wouldn’t work my way through the entire book. Our waistlines couldn’t stand it! So on to “Cupcake Friday”! Seeing how this is the last one, I chose a really fun and challenging cupcake. 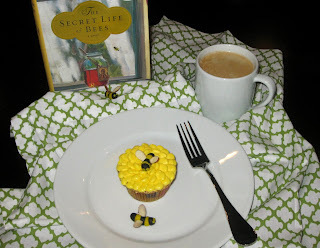 Introducing Martha’s “Honey Bee Cupcakes”! Aren’t they adorable??? Each and every one of you had better exclaim with a resounding “YES!” because these were truly a group effort. Next I called on my talented pastry chef friend, Dianne. She so generously agreed to help me with the piping on the finished cupcakes. I have never done any decorating before and didn’t have a clue how to do it. Arrangements were made for us to get together to tackle and conquer my inexperience with the use of a pastry bag. But first we decided that Bob and I would make the honey bees ahead of time. Let me just say this about that…I seriously never again in my entire life want to make honey bees out of marzipan if I can in any way shape or form help it! Whew, got that off my chest. For two evenings my dear husband (and I do mean dear. Our wedding vows did not include prevailing through the making of miniature insects out of a paste made of pulverized almonds!) 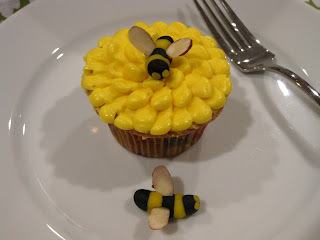 and I fashioned little bees out of marzipan. For those of you that are not familiar with marzipan www.wizegeek.com define it as: “Marzipan is an almond and sugar paste used to ice cakes and other pastries or sculpted into a variety of shapes to be eaten as candy or used as cake decorations.” It all sounds easy enough. And Martha’s directions make it all sound so easy. Yeah, right. Well it’s not! Okay? This was way worse than those little flowers we sugared last week! But oh so worth it! They turned out pretty darned adorable! While they aren’t as petite as Martha’s, who ever saw a petite honey bee? Bob and I laughed pretty hard when one of mine came out about three times larger than the others; and the bees we were making were much bigger than those in the book. What the heck! She’s a big girl so she’s the Queen Bee! I bonded with her and I became especially fond of her. In the end we made a total of thirty bees in all. That’s not even counting the throw aways or the ones that got eaten. I took my prized box of candy honey bees over to Dianne’s house for my next lesson. Let me take a moment to tell you that I have witnessed firsthand the incredibly gorgeous and insanely delicious desserts that have come out of Dianne’s kitchen. The woman is wicked good with butter, sugar, and flour! So I humbly entered her kitchen with respect oozing out of me. Now, I’ve gotta tell you I love this gal for ever so many reasons. Not the least being that she handed me an ice cold margarita! Woohoo! Now we’re talking! This is one lesson I was sure to like. But I swear we just had one. Honest. Just one. Dianne had the buttercream already colored yellow and ready to go. She filled a disposable pastry bag fitted with the curved tip. Let the games begin! I spread the crumb layer on the cupcakes and Dianne began to pipe. I watched her work, leaning over her shoulder and breathing down her neck. Her cupcakes were coming out so cute! When it came time for me to pipe, well let’s just say that my cupcakes look more like a wilting dandelion than her sunny dahlias. I watched her so carefully and thought I had the technique down. But I guess it’s like anything else that’s new. It just isn’t as easy as it looks. I do think with some practice I would get better. At least I hope I would! But I sure didn’t want to practice on these cupcakes. So I stepped back and let Dianne work on the cupcakes while I worked on my margarita. Very judicious of me, wouldn’t you say? The finished product is really cute. I love them! Truly I do. The cupcake's flavor is really unique. You can certainly taste the honey. And who doesn’t love a cupcake topped with buttercream frosting? But what really makes it cute is that little marzipan honey bee. You can almost hear them buzzing! 1. Make cupcakes: Preheat oven to 325˚F. Line standard muffin tins with paper liners. Whisk together flour, baking soda, baking powder, salt, and cinnamon. 2. With an electric mixer on high, beat eggs and sugars until pale and thick. Whisk together honey, milk, oil, and zest. On low speed, mix honey mixture into egg mixture. Add flour mixture in two batches, mixing until just combined. 3. Divide batter among lined cups, filling each three-quarter full. Bake, rotating tins halfway through, until golden brown and a tester inserted in centers comes out clean, about 25 minutes. Transfer tins to wire racks to cool 15 minutes; turn out cupcakes onto racks and let cool completely. 4. Make bees: Divide marzipan in half. Tint one portion yellow and the other black with gel-paste food color. Roll each portion into a rope, a little less than ¼ inch thick, on a work surface lightly dusted with cornstarch; cut rope crosswise into ¼ inch pieces. Alternating between yellow and black, gently press together four pieces to fork the body. Pinch off two tiny bits of yellow marzipan. Roll into balls; press onto head. Press almonds into bee for wings. Repeat to make 20 bees. 5. Decorate cupcakes: Tint buttercream pale yellow; spread a thin layer of buttercream over cupcakes. Transfer remainder to a pastry bag fitted with a small curved petal tip (#59). Starting at outer edge, pipe petals in a circle, holding tip perpendicular to cupcakes. Pipe more circles of petals inside first to cover. Refrigerate 30 minutes to allow frosting to set. Cupcakes can be refrigerated up to 3 days in airtight containers; bring to room temperature and top with bees before serving. These are on my list of ones I want to make! They turned out so cute, but I can understand what a pain the marzipan bees were - I had the same feelings with the ladybugs I did a few weeks ago! No wonder I haven't heard hide nor hair from you in two days! All those cute little bees!